When choosing the mobile testing platform, there are many things that should be taken into account. The chosen service should meet most of your requirements: have the basic functionality, such as bugs and crashes reports, ability to distribute the revision over the air, be simple in usage, reliable and, of course, support the platforms you would like to develop the apps for. One of the popular solutions, TestFlight, was able to satisfy the needs of many developers. However Ubertesters has something that TestFlight is missing – we support both, iOS and Android platforms. If you decided to try the new solution and check all the benefits of the developing platform, if you are managing the apps for both, Android and iOS – Ubertesters is right for you. 1. Supported platforms and versions. The Ubertesters solution supports both, Android and iOS platforms. And YES, it is possible to test the apps on the devices with iOS 6, 7 and 8. In fact, the SDK integration is not compulsory. We allow to use Ubertesters without SDK integration, however in this case you will receive the limited list of features. If you prefer to try all the benefits of our platform, you need to follow a few steps to integrate your app with our SDK using detailed SDK manuals. 3. Upload revision and start testing. TestFlight requires from the developer to pass through the app review and the app should comply with the full App Store Review Guidelines. Are you serious?! With Ubertesters the revision uploading takes 1 minute and does not require any long preparations. Just drag and drop your build to the project – and the revision will appear on the server. There is no need to pass through the review process – you are the only person who decide when to start the revision, it is possible to start it immediately after the upload. Select one of the options provided in the web-interface and install Ubertesters app on your phone to have the device connected to your account. Then it will be possible to proceed with your app installation and start the testing process. Invite the testers to your project by sending them an email. They’ll need to sign up to Ubertesters using web-interface or mobile devices to be able to test your app. You can find the detailed information at our step-by-step instruction. While in Testflight the number of internal testers is limited to 25, with Ubertesters you can invite the unlimited number of testers. Besides, the Ubertesters “Hire Testers” program allows you to access the global crowdsourcing community of unlimited number of on-demand professional mobile testers and the wide range of real devices through our Ubertesters platform. How can I transfer my testers from TestFlight to Ubertesters? 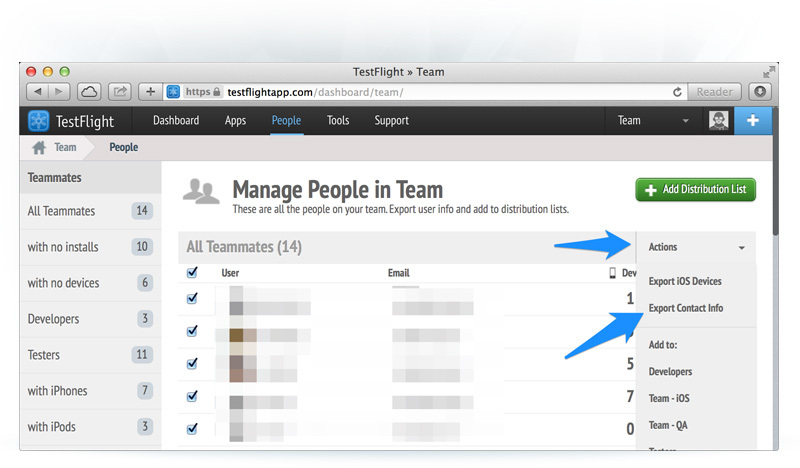 From the People tab on the TestFlightApp.com Dashboard use the Action menu to export your tester’s contact information into a CSV file. 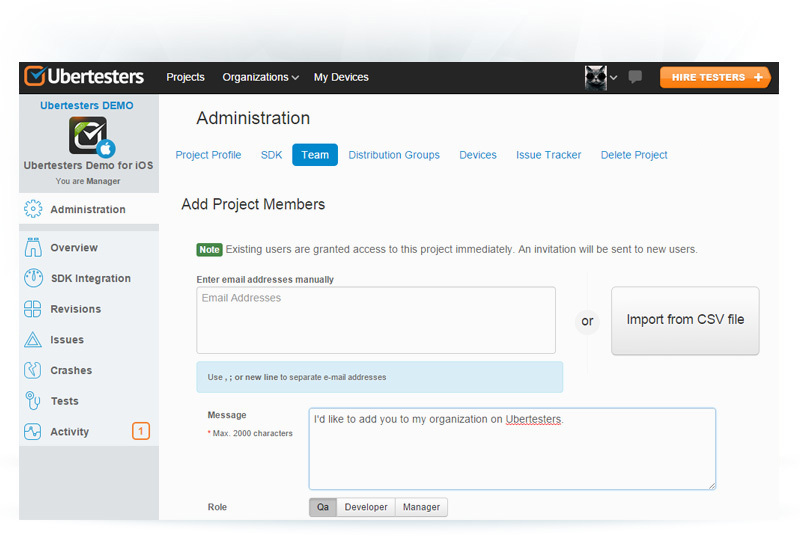 Then log in to Ubertesters account, navigate to Administration tab of your project and select ‘Team’ tab. Select ‘Import CSV file’ to proceed with the import. Over the air distribution is the modern way to spread your builds. It is used by many companies, including TestFlight. But only the Ubertesters can guarantee that it will be fully controlled from your side. Grant an access to the revision. When the revision is started, you can set the list of members who have an access to the revision. It is possible to grant or restrict an access to a certain revision at any time. The list of project members with a note if the revision is granted or not is provided into your Ubertesters account. Get more information about how to control OTA here. Our API methods allows you to do custom logging and to send an important system event information to Ubertesters server dedicating to storing and archiving this data. You can check the recorded logs directly in your account. You will be able to report issues and crashes directly from the mobile device with a tested app. If you prefer to use the advanced crash reporters, you can disable Ubertesters crash reporter and receive the reports from the third party tool. Check how to submit a report with Ubertesters here. If you prefer to use some advanced crash reporters, you can disable the one provided by Ubertesters using one of our API methods and receive the crashes to your favorite third-party tool. We provide the option of monitoring the performance of your testers, check what issues or crashes were reported by a particular user. It is possible to check the session tracking, its active time and get the detailed info about the user’s device. We support bug tracker integration, which allows you to use Ubertesters along with your bug tracker and push the issues from our platform. This feature is very convenient for those who got used to managing the bugs in another software or whose testers are not the members of Ubertesters account. You can create the test cases in Ubertesters account, use them while sending the reports and check whether the test was successful or not. If you previously stored the test suite in other program or just in excel file, you can import it to us. If you would like to know the issues related to the certain device model, you can check the issues, crashes and sessions reported from the required device. You can also find the info about the team member who are using the device to get in touch with him. It will take you less than no time to start working with Ubertesters! You will be able to manage all your apps built on Android, iOS or cross platform software. User-friendly interface and wide ranging functionality, ability to customize the options and integrate the account with different bug trackers makes the migration to Ubertesters rather reasonable. Try it now for free and check the results!